SCMS School of Engineering and Technology is associated with SCMS group of educational institutions becoming a center of excellence since 2001. 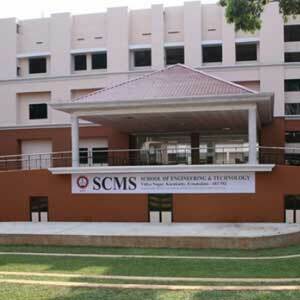 The SCMS School of Engineering and Technology has a 29 acres campus in Ernakulam district, Kerala. SSET provides state of art facility in a highly disciplined environment. As per GHRDC & CHR National Survey SCMS is found to be 14th in the country. SCMS has granted AA+ certification by career 360 magazines. To become a world-class center in providing technical education. To offer practical-oriented education to meet the growing challenges of the industry and society. Top Recruiters Infosys, Mahindra, UST global, Syntel, Wipro, MRF, HP, Spectrum, CISCO, Godrej, MPHASIS, Cognizant, Hexawave Technology etc. The institute offers a 4-year undergraduate programme for B.Tech course approved by AICTE. The admission at SSET is centralized at the corporate office of Pratap Nagar, Cochin. Admissions at SSET are purely merit-based. Candidate needs to clear KSEET entrance test for admission in B.tech programme. Appropriate preference will be given to the candidate having merit cut off marks. There are no capitation & donation fees. Be aware of fraud agents. Applicants age must be 17 years as on or before 31st December 2018. Candidate needs to have Indian citizenship. Candidate should have a minimum aggregate of 60% marks in physics, Chemistry and mathematics subjects. For NRI candidates, KSEET exam is not mandatory. SCMS School of Engineering and Technology has already maintained its reputation by providing quality education since 2001. Our main aim is to produce world-class professionals to meet present and future challenges in business and industry. We have an excellent academic record with a team of a committed and dedicated faculty member. SSET has set its benchmark in the field of education and pedagogies. With high notch teaching education, SSET serves society at large commitment. SSET offers spectacular opportunities for UG and PG students and also enhance the students to discover their future career paths. Department of automobile engineering was established in 2004 at SSET. Department offers the undergraduate program with an intake of 60 students. Department organizes workshops, seminars, conferences for understanding the trends in the automobile field. Quality technical services provided to students to bridge the gap between academics and industry. Students can able to work on live projects in the areas of the core domain. Department provides ‘TORQUE’ platform through which students can able to participate in technical events. Department has 5000 sq ft. Automobile lab fully equipped with automobile equipment. Department of Civil engineering at SEET was established in 2001 which offers a four-year bachelor degree in civil engineering. Department also provides a master degree in computer-aided structural engineering and environmental engineering. Department has advance teaching-learning process to meet challenges while handling professional ethics. Department has seven well-equipped laboratories with adequate research facilities. Department has signed MOU with the foreign universities for establishing student exchange programs. Department of Computer Science and Engineering was established in 2004 imparts quality education producing quality professionals. Adequate training is given to students to meet the challenges in the IT industry and the global market. Department has 120 intakes for the b.tech course and 60 intakes for the master course. Department equipped with state of art facilities, expert faculty, and modern environment. Department of Electrical and Electronics Engineering was established in 2002 with an intake of 60 students. Department has a practical teaching methodology and theoretical approach leads to development in research and industry in the field of Electrical and Electronics Engineering. Department has a sophisticated laboratory with well-equipped electrical equipment. Campus placements are provided to students with a lucrative salary package. Department of mechanical engineering was established in 2001 at SSET which offers UG program with an intake of 120 students. It also provides specialization courses in production and industrial engineering with an intake of 18 students. Department has well-established machines and equipment like 3D printers, CNC lathe, CNC Miling machine, flexible manufacturing systems. The department also focuses on the study of computer-aided drafting design software like Creo, Catia, Solid Modeling etc. Students can participate in technical and non-technical events maintaining societal relevance. Department of Basic Science and Humanities was established in 2001 in various disci[pline like mathematics, physics, chemistry. Department includes the study of foundation courses in Engineering physics, engineering chemistry, linear algebra, complex analysis, probability, and statistics, Laplace transform, numerical method, operational research for both graduate and postgraduate level. SSET institution is ranked 38th position among top-ranked institutions by a technical survey conducted by Dataquest magazine. The campus has distinct hostels for boys and girls. Hostel is situated in surrounding greenery with intake of 489 for boys hostel and 390 for girls hostel. Separate hostel accommodation is provided to first-year engineering students. Securities are assigned to each hostel. The institute has 22 college buses for students and staffs which covers all pick points of the city. Schedule of the bus has arranged as per class timings for sake of students and staff convenience. Separate buses are available for first-year engineering students. The college has a good collection of stationary and books acquires upgraded journals, notes, and publications. A store has attached a reprographic center for scanning, photocopying and binding the reports. The campus has a Union Bank of India along with ATM facility to accommodate student’s transactions. Reputed companies visit the campus for conducting interviews. A recruitment process is carried out by placement cell. Entire details like a job description, eligibility criteria, salary structure etc. will be given to students to enroll for placements. Base on the company structure selection process is conducted successfully. Know more about SSET placements.